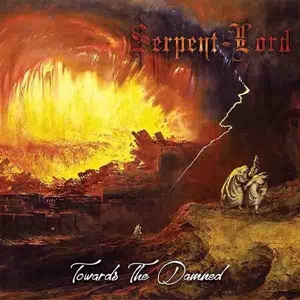 Intriguing background information regarding Serpent Lord (GR) – a Greek heavy metal band who formed in 2016 and present their debut full-length Towards the Damned. Behind the quintet the philosophy illustrates a meet and greet of sorts for your occult side and evil thoughts – which could be your worst dream, or your best nightmare. Sort of a Dr. Jekyll and Mr. Hyde outlook, equally intoxicating when you take in the ten songs that while fundamentally traditional in scope, heighten awareness through progressive and darker/atmospheric textures. ‘Liberty and lechery reign’ during “Nephilim”, an early first half standout because of stair step rhythms which include acoustic clean ambiance sections against an otherwise mid-tempo template, the work of Axel Forsaken and Giorgos Terzitanos stunning through exotic chord constructs and atmosphere against an epic vocal performance. “Evvuio Oitovo Iman” features multiple vocal aspects, invoking a Middle Ages chanting /choir feel at times as well as some gothic textures while the music moves from uplifting progressive metal to straight power riffs, and occasional Moonspell-like darkness during the verses where bassist Konstantinos Sotirelis and George contribute to verse, chorus and choir action vocally to support Marios Arikas’ main duties. The band delivers memorable passages throughout because of their subtle attention to transitions, never becoming overly flashy but setting things up to where the listener can be hypnotized through lead breaks, doom/epic hook combinations, or majestic melodies. Marios as a singer runs the spectrum from baritone propensities during “Blood Offering” to higher range notes in “Ambassador of the New Age”. It’s rare to hear a band that can go from Candlemass-like doom to Iced Earth, In Solitude, or even latter period Death and make sense of it all – but Serpent Lord GR are successful at streamlining those influences into a tangible style that works organically. Towards the Damned has the potential to be one of those albums people talk about with reverence in smaller, cult-like circles. If you wish to seek out something different in the doom/power metal realm, Serpent Cult (GR) could be that left field act that swallows your headspace.